Engraver Makes a Monkey Out of Darwin! In 1925, the country was embroiled in an explosive controversy over Darwin and evolution. While the Scopes “Monkey Trial” was underway, it may have made its mark on the Peace Silver Dollars produced at the U.S. mint. The alleged story goes that U.S. Mint Chief Engraver John Sinnock purposely highlighted the word “God” on the coin’s motto, proclaiming his own belief on the subject. 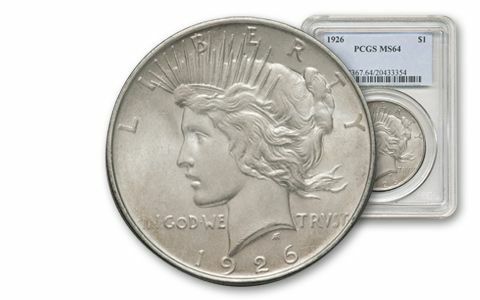 Today, his 1926 Peace Dollar design with GOD in high relief is elusive and sought after, but you have the chance to secure one graded by either the Numismatic Guaranty Corporation (NGC) or Professional Coin Grading Service (PCGS) as being in fantastic Mint State-64 (MS64) condition. Grading service varies. Order now! GOD MAKES A GOOD IMPRESSION – Following the events of the Scopes “Monkey Trial” in which a Tennessee teacher was prosecuted for teaching Darwinism in his high-school classroom, someone at the U.S. Mint in Philadelphia emphasized the word GOD in the motto “IN GOD WE TRUST.” The master dies for the 1926 coinage would have been under preparation during the last quarter of 1925, at which time the Scopes Trial was still very much in the news. 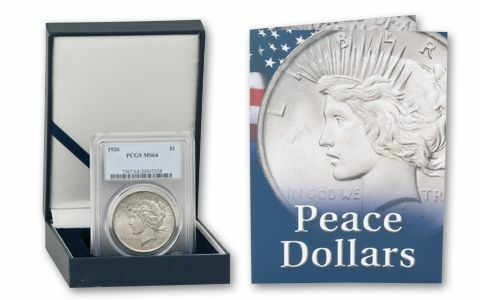 FAMOUS PEACE SILVER DOLLAR – While not as popular as Morgan Silver Dollars, the Peace Silver Dollar series has seen its reputation grow with each passing year. Designed by Anthony de Francisci, it features a design of Lady Liberty on the obverse and a perched eagle on the reverse. It was struck only from 1921 to 1928 and again in 1934 and 1935. 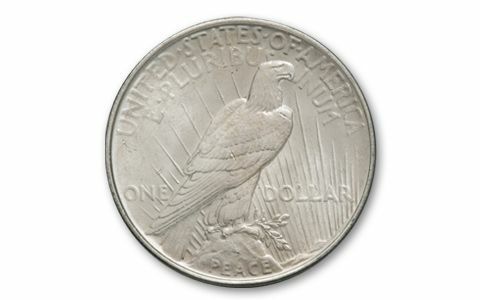 STRUCK IN FINE SILVER – Each 1926-P Peace Silver Dollar was struck in 26.73 grams of 90% silver. LEGAL TENDER U.S. COINAGE – These coins were $1 legal tender in the United States and circulated widely during the Roaring ’20s. 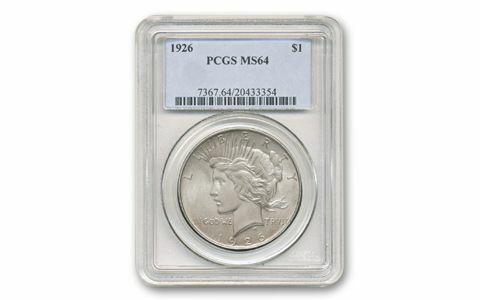 HIGH-GRADE UNCIRCULATED CONDITION – Your 1926-P Peace Silver Dollar has been graded by either the Numismatic Guaranty Corporation (NGC) or Professional Coin Grading Service (PCGS) as being in fantastic Mint State-64 (MS64) condition. Grading service varies. The U.S. Mint weighed in on the Scopes Monkey Trial with the 1926-P Peace Silver Dollar that emphasized the word GOD in the coin’s motto. Now you can weigh in on it yourself by securing this fascinating historical coin in gleaming Mint State-64 condition! Click it to your cart today!